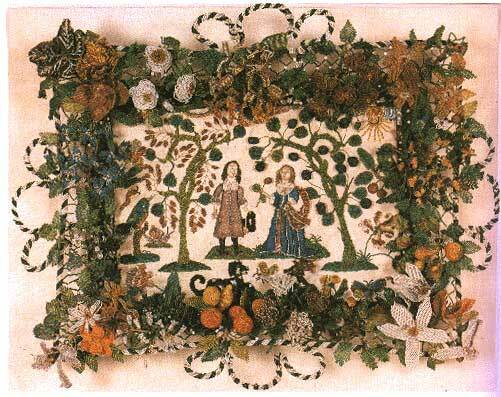 Said to have been made by Elizabeth Clarke (1655-99) when she was about twenty years old. These baskets may have been made to celebrate betrothals and used to hold gloves or sprigs of rosemary given to wedding guests. Thanks to: Lady Karen Larsdatter for donating this piece to the page. This entry was posted in Baskets & Decor, Period Beadwork and tagged wirework. Bookmark the permalink.